One of my favourite animals is the European hedgehog. Although there are as yet no hedgehogs in my Willow the Vampire stories, I’m determined to include one or two in future plots. Why? Well firstly, because they’re cute and seem just the type of animal a child-vampire like Willow would enjoy observing in her garden. Secondly, because this particular writer has a lot in common with hedgehogs – not in looks, you understand, although most people who’ve met me in the flesh would say that 3,000 bristles sounds about right! 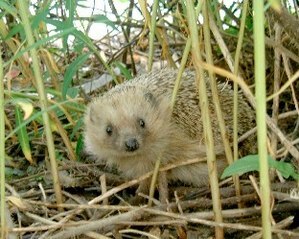 Hedgehogs are nocturnal insectivores, a group of mammals that includes shrews, voles and moles. These spiky little wonders are frequent guests to our suburban gardens, munching their way through worms, slugs, bugs and young birds that have fallen out of the nest. Nearly all insectivores walk with a plantigrade gait on account of their flat-footedness, keeping their entire soles, heels and toes on the ground when they stroll through our hedgerows, vegetables patches or through wood- and grassland in the wild. They tend to be shy and secretive, and when they feel threatened they roll up into a spiked ball, displaying all of their 3,000 bristles to full effect. Razor sharp, these bristles are meant to protect them from inquisitive predators like foxes…I don’t know about the hedgehog, but it usually works for me. Their Latin family name is Erinaceidae and their spread covers Europe, Asia and Africa, where desert hedgehogs live in burrows, keeping out of the heat during the day and coming out at night to hunt. Just like me after my chemo therapy, hedgehogs have poor eyesight, but good hearing, by which they locate their prey (in my case that happens to be ladies behind the counters of bakery shops praising the yumminess of their Danish pastries and muffins). Although I’m not nocturnal, having my best writing times very early in the morning, I’ve met many writers who say they prefer to write late at night, when it’s quiet and there are fewer distractions around. Just like the European hedgehog though, I feel the need to curl up into a bristly ball, when somebody addresses me as “oh, YOU’RE the writer lady”…which happens more often than I’d like. I don’t know what it is about writers…there seem to be only two categories around…those who are outgoing to the point of being pretentious and utterly irritating and those who don’t like to talk about how they put words onto a page and get the stories out of their heads. Some writers will whip out their latest opus at the drop of a hat and ask, if they should sign their book for you…no matter how inappropriate the situation. They don’t even wait to ask if their book might be something you’d like to read…they just assume THEY WRITE ergo YOU must be a fan. Other writers, and this is the category I belong to, feel there should be time off for good behaviour. I mean…I write for a living…I get commissioned to write things all day long…when I go out, I want to be somebody else…instead of a hedgehog, I wouldn’t say NO to being an engaging Large-eared tenrec for a change or perhaps a Ruwenzori otter shrew with webbed feet…or better still, an Elegant water shrew with a gorgeous black coat and white tummy. If I were an electrician, carpenter or window cleaner, would people still want to know in excruciating detail how I go about my daily business? I’d have to say I belong to the latter of the first two groups you mention, and I have been known to prickle :). I love the pictures! I guess I’ve never seen a hedgehog pictured with a person, I didn’t realize they were quite so small. That hedgehog in the hands looks something like a little hamster. Now I want to get one to run around my house in a little plastic ball! It’s still a baby, the hedgehog in the hand. Grown up hedgehogs are about half the size of a football when curled up. Hedgehogs taken from the wild don’t make good pets as they are full of fleas…but you forgive them for that because they are so cute. There is a hedgehog cactus which you may see in garden centres as pot plants, though the big ones grow wild in North America. They have ribbed, woolly stems with hundreds of spines and bear mostly yellow flowers….but do not try to pick them!! I believe hedgehogs are related to porcupines, the South African farmers’ pest. When they die or are killed, their tough, cylindrical spines are removed and are used to make jewellery: I have a necklace of black and white porcupine quills interspered with small coloured beads. It’s really efffective! Well, I’ve got an above average IQ, so hadn’t planned on picking any cacti, porcupines or hedgehogs out of their natural habitat. I can work out for myself that touching them is a bad idea! Honestly Beryl, what a patronizing thing to say. When I was a child we often helped undernourished young hedgehogs to get through the winter. We’d make a nice nest box for them and let them slepp in our basement. They love cat food by the way! I love hedgehogs, we have a few in our garden. One is huge and he lumbers around like he has all the time in the world. He can’t even be bothered to curl up in a ball. The other is small and curls up quickly when Mildred, The Laboratory cat, approaches. As for types of writers, I am in disguise. I think some people would be open mouthed if they knew about my secret life.